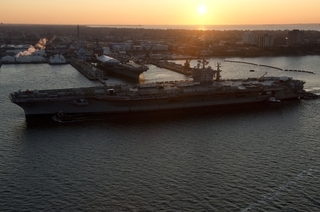 NEWPORT NEWS, Va., March 28, 2013 (GLOBE NEWSWIRE) -- Huntington Ingalls Industries (NYSE:HII) welcomed the aircraft carrier USS Abraham Lincoln (CVN 72) to its Newport News Shipbuilding (NNS) division today, following a six-week delay in its arrival. Lincoln was originally scheduled to arrive Feb. 14 for its refueling and complex overhaul (RCOH), but it was among the Navy projects delayed due to uncertainties surrounding the defense budget and funding of the work. The ship's transit to NNS is being funded under a planning contract. 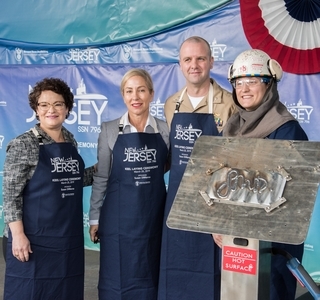 "We are pleased Congress passed, and the president signed, this important legislation, which enabled the Navy and Newport News Shipbuilding to move the Lincoln to our shipyard today and begin the RCOH," NNS President Matt Mulherin said. "Most importantly, this provides continued job security and stability for our workforce and provides continuity of our RCOH programs, which contribute so significantly to the defense of our great nation." NNS' overhaul team began working on the ship at the Navy base in Norfolk and made progress prior to Lincoln's arrival at NNS. "The ship-shipyard team has worked hard to prepare the ship for a successful start to refueling complex overhaul," said Capt. Karl Thomas, the ship's commanding officer. "Since our Norfolk arrival in August, I've been very pleased with the energy of the entire Newport News shipyard, Supervisor of Shipbuilding and Lincoln crew. We're committed to getting this project off on the right foot, completing it on time, and getting the ship modernized and back into the fleet ready to serve." The RCOH represents 35 percent of all maintenance and modernization in an aircraft carrier's 50-year service life. Lincoln's RCOH will include the refueling of the ship's reactors, as well as extensive modernization work to more than 2,300 compartments, 600 tanks and hundreds of systems. In addition, major upgrades will be made to the flight deck, catapults, combat systems and the island. Video of the arrival is available on HII's YouTube channel: http://www.youtube.com/watch?v=jOYQcwbehKQ&feature=youtu.be.